In this video, Mary B. Quinton discusses and demonstrates physical handling treatment tools for dissociation, pressure tapping and traction. She demonstrates how these tools are used to change tone and improve movement patterns in supine, side lying, prone, prone to sit, and sitting in a sequencial process that prepares more normal sensori-motor development in babies with abnormal symptoms. 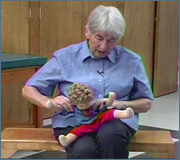 Activities are demonstrated on a doll for clarity.